Manila, Philippines - Giedie Laroco performed Celine Dion's song "Power of Love" during the blind auditions of ABS-CBN's top-rating and Twitter-trending singing reality show aired on Sunday, June 8, 2014. The 13 year-old power belter from Dagupan City wowed the judges with Sarah Geronimo immediately turned her red chair followed by coach Lea Salonga and Bamboo Manalac. Giedie chose Lea Salonga as her coach. Power vocalist Giedie also received a standing ovation from coach Sarah. 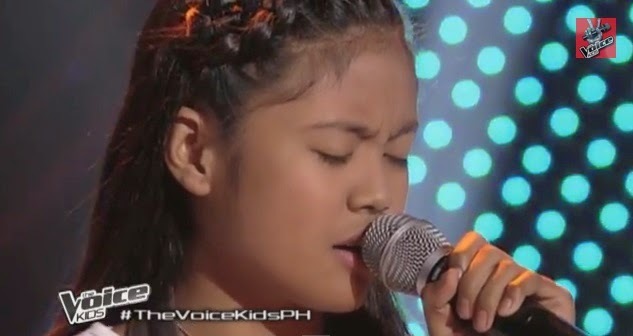 Giedie Laroco is the 8th 3-chair turner on The Voice Kids Philippines. Other artists who are included in the elite list of 3-chair turners are Jimboy Garcia, Darlene Vibares, Nathan Bautista and Echo Claridad , Arianna Ocampo, Isaac Zamjudio and Mitz Tanguilan. As of the June 8 episode, 34 artists have already convinced with at least one coach to turn around, 11 hopefuls getting a slot in each team of Sarah and Lea and 12 artists on Team Bamboo. The Sunday's episode of 'The Voice Kids' dominates online conversations with 'Bamboo', 'Rosarely', 'Natsumi', 'Edray', 'Daboy' among the trending topics. Don’t miss the continuation of the Blind Auditions in “The Voice Kids” every Saturdays, 6:45 PM and Sundays, 7:30 PM on ABS-CBN’s Yes Weekend.